A good thermometer is essential for both children and adults alike. In fact, newborn infants also need a safe and reliable thermometer as their immune systems are still developing. Also, infants are not able to tell us what is wrong and we often rely on cues, as well as signs and symptoms to determine what is wrong with them. One way to determine how your child is doing is to use modern tools and devices like the forehead thermometer. Recently, the market for this type of thermometers has spread, as more and more products are introduced in the market. 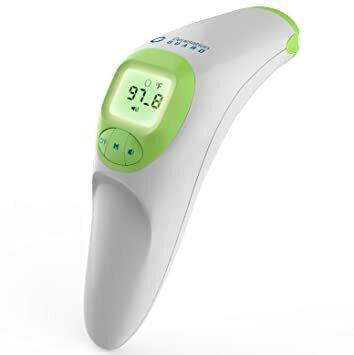 To illustrate, there are already different makes and models of forehead thermometers to choose from, making it rather difficult to find the best forehead thermometer for your child. A forehead thermometer or Temporal thermometer functions like a bar-code scanner. Specifically, you simply hold the device a few centimeters away from your child’s forehead and slowly sweep the forehead. You can get a reading of your child’s temperature in just a second. The reading indicated in the device is taken from the temporal artery. 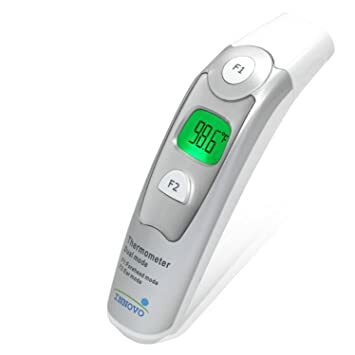 Regarding accuracy, most forehead thermometer models provide accurate temperature, considering that they are used correctly. Also, you should also take note that you may get different readings from time to time, allowing you to question the consistency of the temperature readings. Different readings may indicate that the device needs to be re-calibrated. It should take about a minute or two for forehead thermometers to be re-calibrated. You should take a moment or two to get another reading after you have taken the first one to check for consistency. Also, you have to make sure that the device is at room temperature before using it. If the device is too warm or too cold, you may get an inconsistent temperature reading. There are various advantages when it comes to using a forehead thermometer. The temperature readings provided by a forehead thermometer is quick. Also, the process of taking the temperature is relatively easy. The process is simple, and you use the thermometer in the same way you use a hand-held barcode scanner. 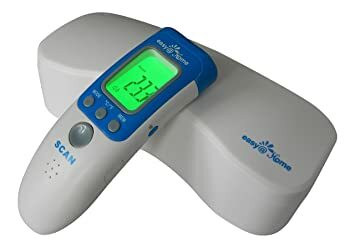 This device is used non-invasively, which means that you do not have to physically manipulate, touch or even wake your baby up to get his or her temperature reading. In fact, you do not even have to remove blankets or get under an unwilling arm. You simply have to hold the thermometer close to your baby’s forehead. Most forehead thermometers are designed with an illuminated LED display, which makes it easy to use in the dark. In fact, you can see the temperature readings easily when you are in a darkened room. Also, forehead thermometers are more hygienic compared to rectal or ear thermometers, as this device do not need probe covers to prevent contamination. Most forehead thermometers are made from durable and long lasting materials. Since this type of thermometer is durable, you do not have to buy new ones regularly just because the previous one does not work already. Not just that, forehead thermometers are also versatile, as this can be used for both children and adults alike. There are several things that you need to consider before buying a thermometer. This way, you can choose the best forehead thermometer for your child. One of the things that you need to note when purchasing a thermometer should be the response time. A temperature reading from a digital thermometer usually takes about 10 seconds to more than 80 seconds, depending on the make and model of the thermometer. There are also thermometers that take about three seconds to provide you the temperature reading. Depending on the response time, you should consider the accuracy of the temperature reading. The response time usually does not matter provided that the reading is accurate. Some thermometers come with protective case covers and other accessories, which may pose a choking hazard for children.For instance, if you are using them for your child, you might want to consider your child’s safety. If the device that you will be purchasing does come with small parts, you have to make sure that the device is kept out of reach of your child and make sure that you do not let your child play with it. The features of the temperature are other things that you have to consider. Besides, there are forehead thermometers that are dual ones, which can also work as an ear thermometer. Also, there are thermometers that emit alarms whenever it is done computing the temperature reading. You might find the alarm convenient. 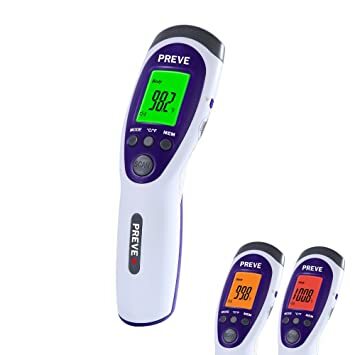 This dual thermometer is the one-stop solution for the measurement of the temperature of the entire family, as this thermometer is applicable for all ages. Not just that, this thermometer is incredibly easy to use and convenient. This device comes with a backlit screen that makes it simpler to use at night. This thermometer works both ways. You can use this as an ear thermometer and a forehead thermometer. You can choose between the two modes depending on who you will take the temperature reading from. This device is designed with the latest infrared scanning technology which is proven to reliable and accurate. In addition, the device can measure both Fahrenheit and Celsius readings. Now, you can take quick and straightforward temperature readings with this device. This thermometer is easy to use and is designed with the latest infrared technology. Without touching your child, you can take temperature readings with this forehead thermometer. Moreover, it comes with tri-color display, silent mode, and a fever alarm option. This forehead and ear thermometer from Generation Guard can take temperature readings in just a second, which is relatively quicker than your conventional thermometers. You can use this device for both children and adults. Not just that, it comes with a quiet mode option, which allows you to take temperature scans from children without the loud beeping that can wake them up. This forehead thermometer offers accuracy and convenience at its finest. You can take temperature readings in just a second. Not just that, this device features a color-coded screen for fever detection, which works perfectly for both children and adults. This device comes with three measurement modes. In fact, this thermometer can take body temperature, surface temperature, and room temperature. Also, this device comes with a silent mode option and a large backlit LCD. Choosing the best type of thermometer for your child or even for your entire family is essential. With the best thermometer, you will have peace of mind knowing that you are able to check the temperature of your child accurately at home. Since there are various makes and models of thermometers, it is always best to take your time in choosing the best one before purchasing. Among the top forehead thermometers in the market, the iProven Forehead and Ear Thermometer (DMT-489) has taken the lead. This device works great for both children and adults alike. Not just that, this can be used either as a forehead thermometer or an ear thermometer. 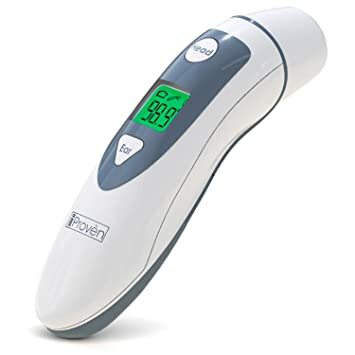 Additionally, this device is a great buy with its great features, user-friendly and safe functionality, and accurate and reliable temperature readings.